Cheim & Read is pleased to present an exhibition of recent work by Adam Fuss. His previous solo show with the gallery was in 2010. Born in London in 1961, Fuss has lived in New York for over thirty years. Known for his experimental work with the earliest photographic techniques, notably daguerreotypes and photograms, Fuss has long explored the natural world and its symbolic manifestations. His camera-less images, captured by a flash of light on a light-sensitive surface, are at once immediate and timeless, spontaneous in conception but profound in the emotional responses they provoke. In his new work, Fuss continues to balance this and other dichotomies (dark/light, presence/absence, life/death), but introduces a new approach to his process. Instead of assembling his imagery on a horizontal surface, shooting from above, Fuss creates the images vertically. An agitated pool suddenly becomes a waterfall. 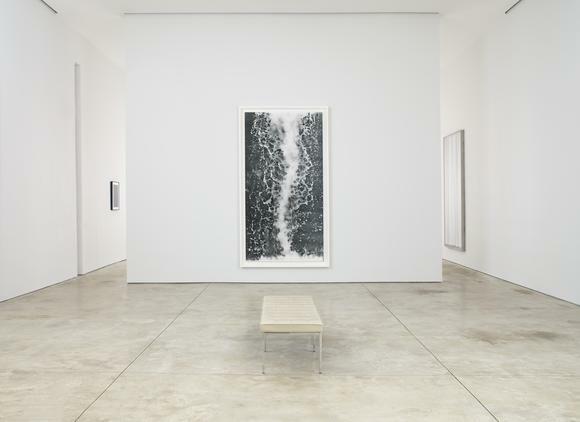 In Fuss’s photograms of water, verticality and its implied movement are integral to his intentions. The image-making process is less predictable, and the work is focused instead on the event and its result—which, as he says, is “a photographic representation of energy”—rather than on its materiality. Monumental in scale at just over 9 feet tall, the images engulf the viewer, and in this way are reminiscent of Abstract Expressionist canvases, particularly the gestural drips of Jackson Pollock or the cool verticality of Barnett Newman’s “zip” paintings. History, however, does not weigh Fuss’s work. As with much of his imagery, the seeming simplicity of his sources (water falling, snakes slithering) is belied by the depth and variety of possible readings, allowing for complex associations and interpretations. The expressiveness conveyed in these works is also contrasted by the impressive technical feats by which they are made. The rush of falling water is tempered by more mysterious photograms of a sheer but unrevealing curtain. Measuring over 9 feet tall, they again overwhelm the viewer with their presence. For Fuss, the image harks back to William Henry Fox Talbot’s first photographic image of an oriel window (1835), and the dawn of photographic processes. At a time when the ubiquity of digital imagery has dulled the initial magic of this moment, Fuss sees the curtain as pulled between two worlds. Referring to it as a strata or layer, he describes it as a division not only between interior and exterior, but between traditional and contemporary sensibilities. He also relates the curtain’s drape and folds to classical Greek statuary, in which the animation of the human body is expressed through sculpted fabric. Abstract in form, the drapery and its “movement” symbolize underlying flesh; it is a boundary between the material and immaterial, between life and death. A final group of works is not made up of photograms, but of scans of snakes printed on linen. As with the water, the snakes—writhing and distorted—characterize energy. The images are reminiscent of Chinese landscape painting, scrolling downwards from the heavens to earth. The linen backdrop is the matrix of the physical world—rocks, mountains, trees—but the snakes are its life force, determining the flow of the composition. While verticality unites all of Fuss’s new work, this representation of energy is paramount. It pulsates through Fuss’s imagery and resonates in our consciousness. The title of the exhibition, λόγος, is a reference to this vitality. As understood by the Stoic philosophers, λόγος is the uniting principle between reality and the cosmos, the divine connection between the rational and the spiritual, and the reverberation that echoes through our bodies and the less definable form of the Universe.